Warmer day, close to 50. 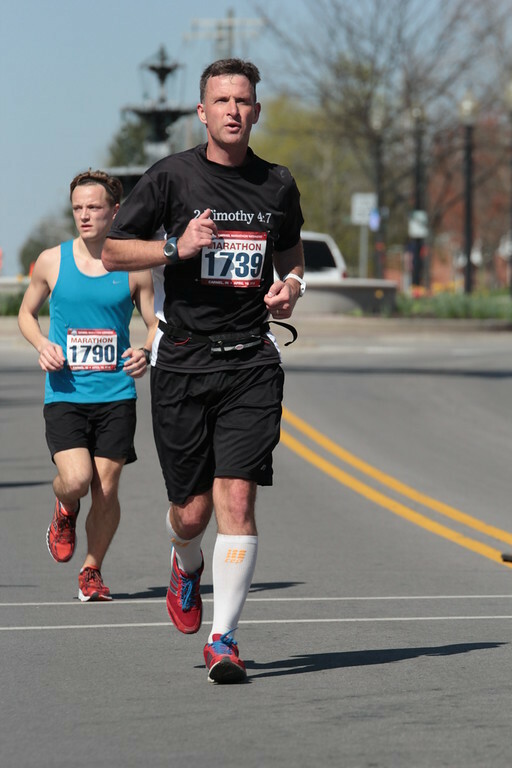 I missed yesterday - no details, but I am hoping that as April has broken through that I can get back in the groove and set some PR's this year. 8 miles, felt good. That actually makes me happy since 2 days ago it felt good too. After the blah running I had before it is most welcome. Kenpo X in the am for an hour. 8 miles in the afternoon, and once again it felt good. This routine is an experiment by me, but I think I will be using it for a little while if it is going to keep my running feeling good even if my miles may be down for a few weeks. Had missionary friends in from Kenya, Jordan and South America - was nice to see and talk to them all. Sun is my day normal day off - It was so nice I wanted to just get the blood flowing and clear the mind. 7 Easy. Its official, its not just allergies, I am sick. Got my run in early and then realized I had a small fever. I worked only a short time and came home early - first time in over two years that I missed any work for me being sick - or just flat out being sick for that matter - (not the kids ha!) Wanted to do my workout as well, but the body aches were too much. Hope I can get some strength and energy back for tomorrow. Feeling a bit better - crazy busy day, but managed to get outside and run as my daughter rode her bike till she was tired. Also did Core Synergistics. Pleasant weather to run in. Shoulders and Arms +Ab Ripper X + 8 mile run. Feel pretty good... work was a little long today, but tomorrow should be better - I would like to get up and work out elsewhere in the am, but that is not going to work out - so I have to go to plan B. Mid 60's run. Still no Garmin which is a blessing and a curse - either way my mind wandered during the entire run. A little sore today so I opted to skip the P90 for a change because I wanted to keep my run. 51 today with a steady rain and headwind (with some strong gusts). Today was a good run. Although it was not blazing fast or anything special, it is the first long run in quite some time that actually felt good. The last several I felt like I was sick, or struggling or just did not have it. It was nice to feel good during the run. 8:01 avg pace - I have no splits and ran by feel (no garmin, just stopwatch) which I was happy with considering the conditions outside. So at the hotel, north of Detroit. Its 67 back home and I am in a winter weather advisory. Ok nice. So off to the treadmill. I looked at it and said eh- I will do an easy few miles and then use one of these preset runs. The 60 minute one looks fine, I mean I am looking for an easy run so that would be fine. Its starts off like expected, 4.5 mph for a minute and then 5.0 for a minute, the 5.5 for a minute raising the grade to 2%. I am thinking, okay I wanted easy, but this is too easy... but I wait a few and then it jumps to 7.5 mph... okay now I am moving and the 2% grade made it not so easy. Then every minute the grade changes. 1%, 2%, 3%, 4%, 3%, 2%, 3%, 4% - you get the idea. Well after 20 minutes it got pretty darn challenging for that easy run I thought I was having as it went 5%, 6%, 5%, 6%, 7%, 6%, 7%... you get the idea again... it finally got down to the 4% and less in the last 7 minutes. So it was a pretty good run since it kept me on my toes (while I tried to watch the game show network). Rainy run... my legs always feel weird after running on a treadmill for a few days and then back to the roads. Wonder why that is. I'm tired from travels. Took a new route today, liked the benefit that came with that. The run was pretty progressive until a side pain, not sure what that was all about. It was not a side stitch, just a pain higher up, almost under the arm. Faded after a bit. Light rain felt good. Took the last 2 days off running and did mainly core workouts. My groin muscle is giving me trouble again and even was walking with a bit of a limp yesterday. I am not sure what to try next. I will continue to do exercises, use ice and rest when possible, but it is very annoying. Wonderful day to run. AM 8 and PM 4 - great weather as the storms held up for the day. I am trying not to complain, I am thankful for everything, just hard when I want to take things to the next level but get held up by my own body. What a fun morning to run. It started clear. Nice cool drizzle by mile 4 which turned into a stead heavy ran by mile 6. The last mile and a half were ran in a huge downpour... I loved it! I wanted to get more miles in today, but it was a busy day. PM 4 - got a break just before sunset and ran just after the rain and ran with a very bright rainbow! It was vibrant and just made the evening run go very well. Cool and crisp, good morning to run even if I had to throw on the $1 gloves.